Recognizing that our life as international travelers can be more comfortable, easier and enjoyable should we knew trustworthy people in a visited city, we have started to develop a new concept of personal travel concierge service which is delivered by local people to world travelers and hence can be afforded by anyone who needs it. Basing it on trust, friendship, fun and hospitality we are building a global community of like-minded people who are happy to share their hospitality, local expertise and knowledge with travelers. MeetnGreetMe is a crowdsourced travel concierge service and lifestyle management ecosystem where every traveler can request services tailored to their travel needs and budget. Delivered by resourceful local people and paid via blockchain enabled P2P payment system. Do you need help with organizing a bachelor party abroad? Or you want someone trustworthy to meet your parents at the airport, help with luggage and support all the way during their stay in a new city? Or perhaps you need someone to help you book the hottest night spots and guide you through the night life of the city? MeetnGreetMe is designed to deliver customer-centric service tailored to travelers’ needs and make travel experience a really personalized experience around the world. This is the core value all the interactions are built around. 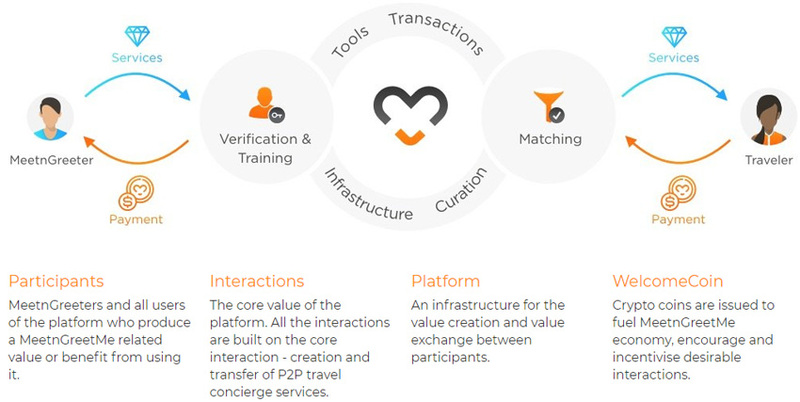 MeetnGreetMe platform provides an infrastructure for the value creation and enables value exchange between participants, sets the rules of access and usage to ensure that desirable interactions are encouraged and undesirable ones are totally eliminated. MeetnGreetMe is a community driven and trust based ecosystem where everyone is welcome to participate with their skills in accordance with their interests and get rewards for their contribution. WelcomeCoin is backed by real MeetnGreetMe services. It means that WelcomeCoins available for sale are directly correlated with the number of service hours which can be acquired on the platform. WEL is much more than just a means of payment. It’s an essential part of MeetnGreetMe philosophy of rewarding community and giving back for the contribution. 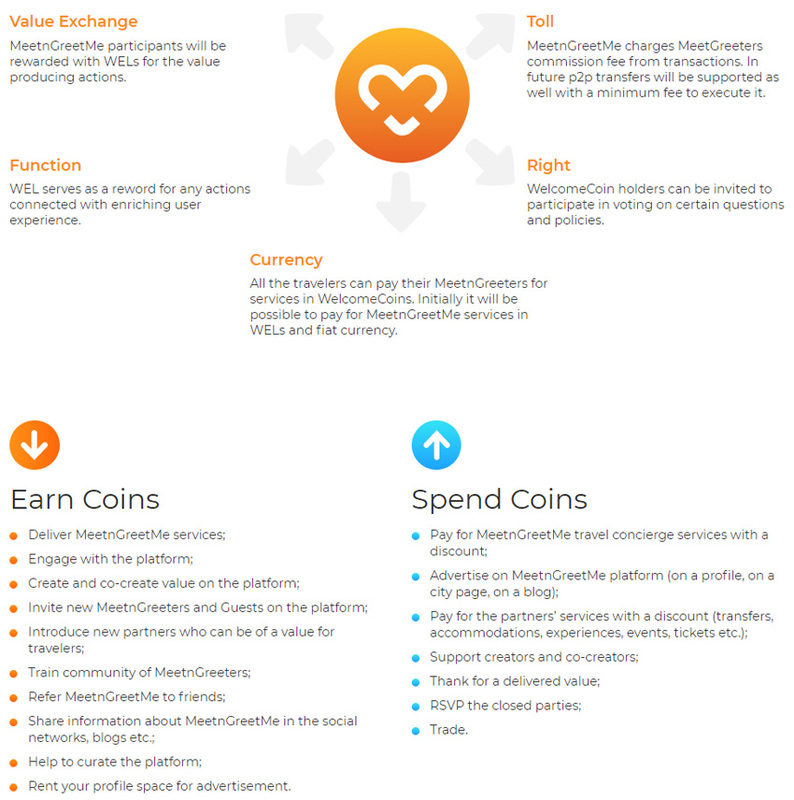 Within the MeetnGreetMe ecosystem WelcomeCoin can buy what money can’t. Incorporation in Estonia and residence in Business Incubator of the High Tech Park. Launch of a fully operational platform with payments, growth of the global community. MeetnGreetMe first customers - individuals and delegations; getting first revenue. UN recognition in Travel and Hospitality category, presence in 200 cities around the world. The Blockchain experts joined our team. ICO: to turn MeetnGreetMe into a solution which changes a way people approach the process of arranging their travel related activities, MeetnGreetMe will launch pre-ICO in December. Community development: decentralized curation strategy; messenger for iOS; P2P payment system; advanced CRM; community trained to pursue decentralized curation; Marketing/PR activities for new key cities. Platform growth. Partnership and expansion in new cities: role and location based database of partners introduced; new partners in new cities; advanced tools for managing MeetnGreetMe profiles; sophisticated matching mechanism developed; new key cities added. Smart contracts for decentralized curation integrated. Functionality for advertising introduced.